IFN-gamma in human SLE: a central role for cutaneous T cells? IFN-γ transgenic mice: clues to the pathogenesis of systemic lupus erythematosus? Transgenic mice overexpressing IFN-γ in the epidermis develop an inflammatory skin disease resembling cutaneous lupus erythematosus shortly after birth. By 3 months of age, most female transgenics develop a lupus-like syndrome characterised by production of IgG anti-dsDNA, antihistone and antinucleosome autoantibodies. The autoantibodies are nephritogenic, with one-third of females developing a severe immune complex mediated glomerulonephritis. Analysis of these transgenics suggests that pathogenic autoantibodies arise via an antigen-driven T-cell-dependent mechanism with apoptotic keratinocytes acting as a potential source of autoantigen. The mechanism of autoantibody production in IFN-γ transgenics may be relevant to human lupus and is consistent with a central role for cutaneous T cells in the pathogenesis of systemic lupus erythematosus in man. Epidemiological evidence implies that systemic lupus erythematosus (SLE) is caused by the action of an environmental agent (or agents) on genetically susceptible individuals . Although the nature of these environmental factors remains unknown, the `downstream' mechanisms involved in pathogenic autoantibody production are being defined. The evidence from both patients and animal models of the disease strongly suggests that antinuclear antibodies (ANA) arise via a classical T-cell-dependent immune response . Furthermore, circumstantial evidence implies that the autoantigens driving this response are nucleoprotein complexes released during apoptosis . The ANA produced are largely responsible for the widespread tissue damage characteristic of the syndrome . The essential role of IFN-γ in the pathogenesis of immune complex mediated end organ disease has been firmly established in several experimental models . However, there is some evidence that IFN-γ may also play a role earlier in the disease process, specifically in the initiation of ANA production. For example, the emergence of SLE, with de novo anti-dsDNA antibody production, has been described in some patients receiving systemic treatment with IFN-γ, suggesting that excess amounts of the cytokine in susceptible individuals can trigger an auto-immune response relevant to SLE . This contention is supported by results from transgenic mice expressing IFN-γ under the control of the involucrin promoter . Involucrin is a component of the keratinocyte cell envelope and its expression is essentially limited to the suprabasal layers of stratified squamous epithelia . In order to study the role of IFN-γ in the pathogenesis of inflammatory skin disease, we generated transgenic mice expressing the cytokine under the influence of the involucrin promoter . Transgenics have markedly elevated levels of IFN-γ protein in the skin and, shortly after birth, develop an inflammatory skin lesion characterised histologically by a dermal mononuclear infiltrate . Most female transgenics over 3 months of age also produce high levels of IgG antinucleosome, antihistone and anti-dsDNA antibodies. The autoantibodies are nephritogenic, with at least one-third of females developing a severe immune complex mediated glomerulonephritis. Autoantibodies against extractable nuclear antigens are rarer but are present in some female animals. Male IFN-γ transgenics do not develop the lupus phenotype . IFN-γ has been overexpressed in several extracutaneous tissues, in all cases resulting in the development of only organ specific autoimmunity [10,11]. Taken with our findings, this implies that the skin immune system (SIS) in females has specific properties that, under the wrong circumstances, can trigger the lupus autoimmune response. How does the SIS generate ANA? By generating IFN-γ transgenic mice congenitally deficient in αβ T cells, we showed that autoantibody production and end organ damage in this model are completely dependent on the presence of functional αβ T cells , strongly implying that, as in the human disease, the ANA of IFN-γ transgenics arise via a classical antigen-driven T-cell-dependent immune response. What is the source of self-nuclear antigen in these animals and how is it presented to autoreactive T cells? IFN-γ is a potent stimulus of keratinocyte apoptosis, and both the basal layer of the epidermis and the dermis of IFN-γ transgenics contain large amounts of terminal deoxynucleotidyl transferase-mediated dUTP nick end-labelling positive material . This material is a likely source of autoantigen in these animals as the self-antigens of SLE are known to cluster in the surface blebs of apoptotic keratinocytes . IFN-γ can stimulate apoptosis by a number of mechanisms; facilitation of Fas/FasL interactions, however, appears to be of particular relevance in keratinocytes . IFN-γ upregulates keratinocyte Fas expression and cells in the epidermal basal layer of IFN-γ transgenics strongly express Fas (Seery et al, unpublished observations). Furthermore, immunocytes expressing FasL are present in the dermal infiltrate (Seery et al, unpublished observations). It is therefore possible that IFN-γ facilitates a productive interaction between these ligands leading to keratinocyte apoptosis. The fact that epidermal apoptosis in these animals is sensitive to inhibition with the pan-caspase inhibitor carbobenzoxy-valyl-alanyl-aspartyl-(beta-o-methyl)-fluoromethylketone (Seery et al, unpublished observations) supports this concept as Fas independent mechanisms of IFN-γ induced apoptosis are augmented by this agent . 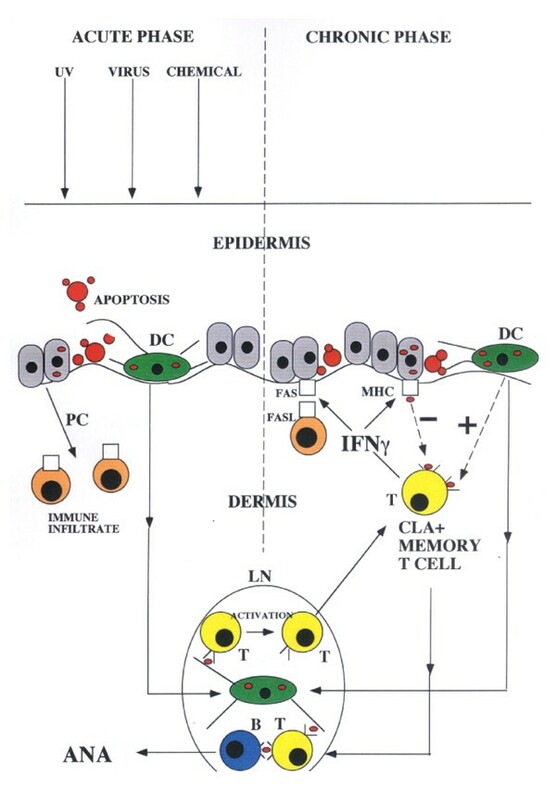 Histological examination of the skin of IFN-γ transgenics suggests two possible mechanisms by which apoptotic material may be presented to autoreactive T cells. First, basal cells in IFN-γ transgenics strongly express major histocompatibility antigen (MHC) class II and intracellular adhesion molecule (ICAM) , and there is evidence that under some circumstances keratinocytes may act as antigen presenting cells (APC) [16,17]. We could not, however, demonstrate B7 expression in the epidermis of these animals and, in the absence of such costimulatory molecules, presentation of antigen by keratinocytes may be tolerogenic (vide infra) . An alternative mechanism of autoreactive T-cell activation is suggested by analysis of epidermal dendritic cell (DC) distribution in IFN-γ transgenics. There is evidence that DCs migrate from inflamed skin to the draining lymph nodes in these animals . Furthermore, remnants of apoptotic cells are known to be taken up by DCs . It seems likely that apoptotic material carried from the skin by these professional APC is presented to autoreactive T cells in the lymph nodes draining the skin, with subsequent activation of B-cell ANA production . Cutaneous lupus erythematosus (CLE) shares many features with IFN-γ induced skin disease: a dermal mono-nuclear infiltrate with FasL-positive immunocytes present , keratinocyte ICAM, MHC and Fas expression [19,20], abundant epidermal apoptotic cells (`sunburn cells') and loss of DCs from the epidermis [21,22]. Interestingly, CLE is a prominent feature of iatrogenic IFN-γ induced lupus in man . If IFN-γ is involved in triggering CLE, this implies that activated T cells (as the major in vivo source of the cytokine) may play a central role in the pathogenesis of the naturally occurring disease. The fact that refractory CLE responds to CD4+ T-cell depleting antibodies is at least consistent with this possibility . Cutaneous lymphocyte antigen (CLA)-positive T cells have been implicated in the pathogenesis of diverse skin lesions including psoriasis, lichen planus and alopecia areata . CLE as a T-cell-mediated disease raises some interesting possibilities because the lesion would be self-amplifying and would provide a potential site of ANA production (Figure 1). A central role for cutaneous T cells in lupus pathogenesis could also explain the apparently contradictory therapeutic response of the systemic disease to UVA irradiation of the skin . Activated T cells are sensitive to UVA induced apoptosis, whereas higher energy UVB could aggravate the systemic disease by inducing keratinocyte apoptosis . There are, however, a number of obvious objections to the hypothesis outlined in Figure 1. Although skin disease is common in SLE, it is by no means universal . Cases without clinically apparent cutaneous involvement presumably have an alternative source of apoptosis derived antigen. Nevertheless, it is worth noting that, in murine lupus models without clinically overt skin lesions, histological examination can reveal subclinical abnormalities. Furthermore, irradiation of the skin in these animals can affect the systemic disease process . Proposed role of CLA-positive T cells in lupus pathogenesis. In response to a range of noxious stimuli, keratinocytes undergo apoptosis and promote the formation of a cutaneous inflammatory infiltrate via the release of pro-inflammatory cytokines (PC) (acute phase). In susceptible individuals, apoptotic material taken up by DCs is transported to draining lymph nodes and is presented to autoreactive T cells (T). Once activated, these T cells stimulate production of ANA by specific B cells (B). CLA-positive T cells are activated and migrate back to the site of injury. IFN-γ produced by these activated cells triggers further basal cell apoptosis by facilitating a productive interaction between keratinocyte Fas and FasL on infiltrating immunocytes. The T-cell infiltrate hence triggers production of its own stimulating antigen and the process becomes self-perpetuating (chronic phase) and self-amplifying. With chronic exposure to antigen, the immune response undergoes affinity maturation. Apoptotic material taken up by DCs further stimulates both infiltrating and lymph node (LN) resident T cells. IFN-γ also induces ICAM and MHC expression in basal keratinocytes. Presentation of apoptotic material taken up by these cells is tolerogenic to T cells (see text), providing a possible safety valve to switch the process off . In this model, genetic defects leading to excessive keratinocyte apoptosis or alterations in the balance of uptake, and processing of apoptotic material by professional and non-professional APCs could determine an individual's susceptibility to SLE. Transgenic models of human disease have a number of limitations. Tissues generally have a limited number of ways in which they respond to insult. Several different types of noxious agents may give rise to a similar pathological picture without necessarily bearing an aetiological relationship to the naturally occurring human disease. However, data from IFN-γ transgenic mice suggest that the SIS is at least capable of playing the central role in SLE pathogenesis. The fact that the lupus-like syndrome in these animals mirrors the human disease in arising via a classical T-cell-dependent mechanism may make it a useful model in which to study specific immunomodulatory therapies. I thank Dr JM Carroll, Dr EC Wang, Dr V Cattell and Dr FM Watt for interesting discussions and ideas during the course of this work.